Pine Needles designer McKenna Ryan infuses her fabric creations with nature. Take an insider’s look at her showroom, retreat center, and beautiful appliqué projects. Pine Needles designer McKenna Ryan has lived on the shores of Lake Michigan, in the backwoods of Montana, and on an island across the sound from Seattle. In each place, elements of nature—wind on the water, the flight of birds, pinecones on the forest floor—have influenced her as a quilter, designer, and entrepreneur. 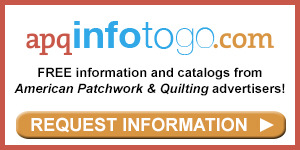 The McKenna Ryan Art Quilt and Fabric Showroom is on Bainbridge Island, Washington. It’s just a 35-minute ferry ride from Seattle and a beautiful 5-minute walk once you hit land. 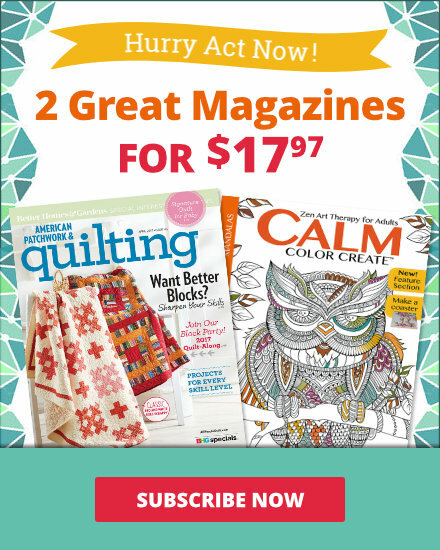 The Quilt and Fabric Showroom is a place to see McKenna’s quilts, as well as shop for her fabric, kits, and quilt hangers. Chairs situated at the front of McKenna’s store provide a spot to sit and enjoy the displays. Light pours in through large windows, which give visitors a glimpse of the beautiful scenery. Petals of My Heart II hangs on the back wall. Petals of my Heart II shows McKenna’s attention to detail. She added three-dimensional butterflies to enhance the flower scenes and provide unexpected texture. McKenna’s store has a large display of her quilts on the walls. At Home in the Woods, Field’s End, Chrissy Down Under, and Once Upon a Star (left to right) are pictured here. 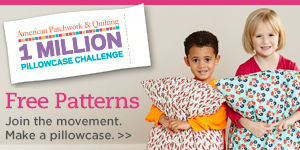 All quilt patterns are available for purchase on her website. This sea-theme room in McKenna’s shop features beachy blues, sandy tans, and pretty purples in both decor and in fabric. Beach Walk hangs on the wall, and Sea Breeze graces the bed. These quilts, part of McKenna’s Cucina Italiana series, artfully showcase pasta, bruschetta, and wine. A close-up of the pasta wall hanging from the Cucina Italiana series shows beautiful batiks, intricate appliqué, and special accents. Blocks from McKenna’s Coffee Classics series can be framed for a kitchen wall. Many of McKenna’s patterns have a masculine feel. Something Fishy is displayed above fat-quarter bundles and an example of the quilt hangers that are handcrafted to coordinate with her patterns. The batik and print fabrics McKenna designs for Hoffman California Fabrics have a complexity perfect for replicating fish scales, water, and other natural forms. In Full Bloom is just one of McKenna’s multiblock quilts, which are composed of different-shape blocks that can be used alone or in one large wall hanging. 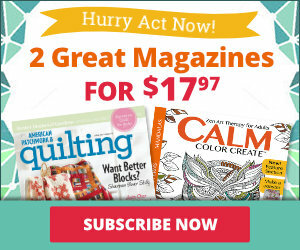 Heaven and Nature Sing is the latest holiday quilt from McKenna. She used sequins, beads, ribbon, hot-fix crystals, and other findings to add embellishments, such as ornaments on the tree and bells on the reindeer harness. In 2003, McKenna moved to Bainbridge Island from Montana. Although she now lives in Portland, Oregon, her former home remains open as a “creative sanctuary.” Named Island Nest, the property includes a studio outfitted for crafters as well as the house. Guests to Island Nest are greeted with a basket of locally sourced goodies, including Pegasus Coffee and truffles from Bonbon Confections. While you’re on Bainbridge Island, take the time to explore its eateries and shops, such as Bay Hay & Feed (bayhayandfeed.com), a combination nursery, gift shop, and farm stand. Island Nest has a beautiful view of Puget Sound and the Olympic Mountains. Guests can hike along local trails, sit on the deck for a nice meal, or relax in the hot tub. Island Nest can accommodate up to six people. 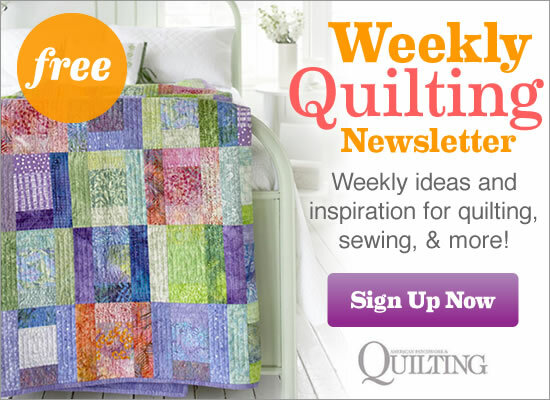 It’s great for a small quilting retreat or as a getaway from the everyday bustle. Serene, contemplative colors are used throughout Island Nest. The master bedroom looks out over the water. Beach-theme accents and colors are found throughout Island Nest, including this second-level bedroom. McKenna even features some of her own creations as decor in Island Nest. This example from the Faith Hope Love collection shows that even a simple design in a single block can be a work of art. McKenna completely renovated the garage to create a studio, which is attached to the living space via a semi-enclosed walkway (not shown). The Island Nest studio is outfitted with large height-adjustable tables, design walls, cutting and ironing boards, and even a coffee machine for any early-morning quilting. McKenna loves pushing two tables together so she has plenty of space to lay out her designs. McKenna’s intricate designs are made with a fusible appliqué method that allows for a stunning finished design anyone can achieve. When designing, McKenna starts with a conceptual drawing. Once the design is fleshed out she chooses a color palette and fussy-cuts imagery from fabric. After cutting the shapes, she layers the pieces for a three-dimensional effect. She fuses the appliqué pieces to the background, adds batting and backing, and stitches around the appliqués with monofilament thread, attaching the appliqués at the same time she is quilting. The project shown is her in-progress Wind in the Whiskers multiblock quilt. Go to pineneedles.com to learn more about McKenna Ryan’s designs and her creative retreat, Island Nest. Visit the McKenna Ryan Art Quilt and Fabric Showroom at 187 Ericksen Ave. NE, Bainbridge Island, WA 98110.